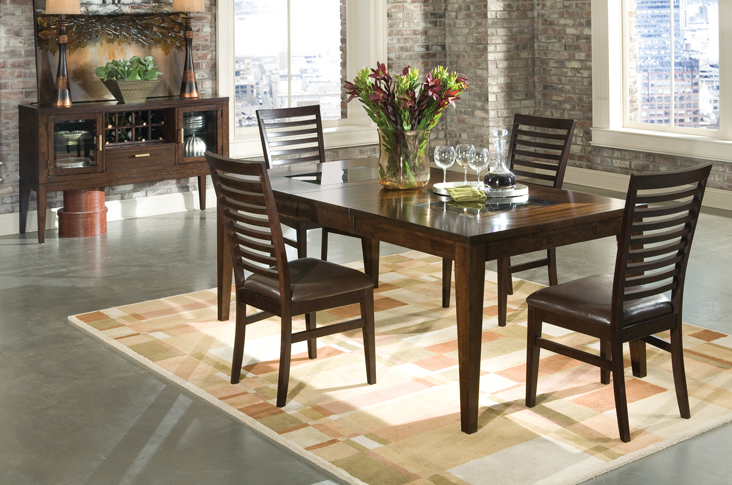 The Kashi dining and occasional furniture collection presents a completely unique and transitional home atmosphere. 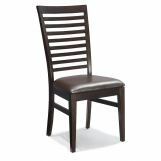 Whether you prefer the casual appeal of pub height dining or the a more standard height dining table, the Kashi collection features thin-striped ladder back chairs with chocolate toned faux leather seats in corresponding heights. 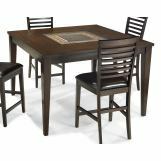 The collection is constructed from Mango wood veneers and select hardwoods with decorative rough sawn Acacia and glass inlays and a durable lacquer finish. A sideboard with a built-in wine bottle storage and framed glass doors with contemporary metal hardware completes the look and offers storage space and a serving area for entertaining guests. The server features the same decorative Acacia and glass inlay as the tables, and the wine rack can be removed and easily replaced with a shelf if desired.